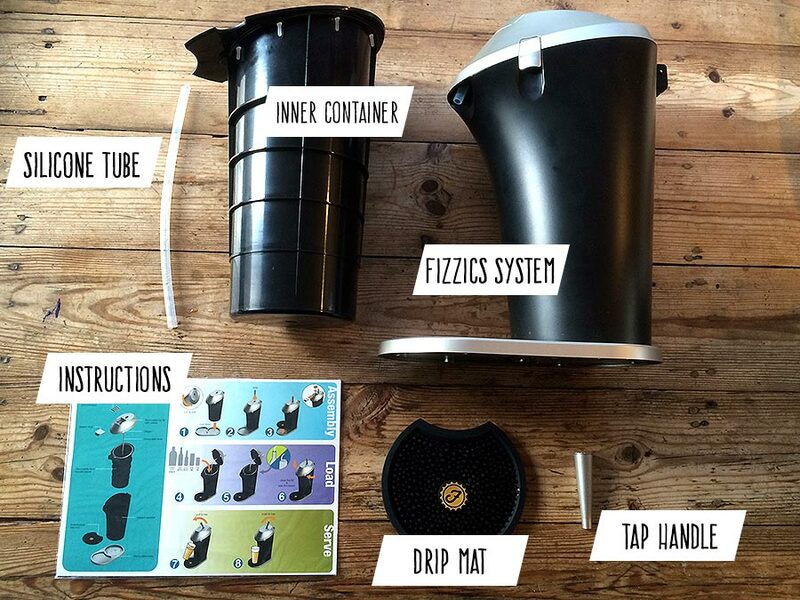 FIZZICS™ IS A REVOLUTIONARY BEER SYSTEM. Our pursuit for great tasting beer ironically began over a draft beer at our favorite brewpub. While enjoying a fresh pour right from the brewers tap, I asked Dave a simple question, that unknowingly would start us off on an incredible journey, ‘why does beer taste so good fresh from the brewers tap, but doesn’t taste nearly as good from a can, bottle or growler?’ And so it began. Our first year of exploration was a relentless pursuit of understanding, research and development, with more failures than one can count. But, our passion and determination grew stronger, and eventually, we perfected the Fizzics™ Technology Platform. The Fizzics™ Technology Platform dramatically improves the flavor, taste and mouth-feel of any carbonated beer, to a level that surpassed our greatest expectations – A Fizzics™ Beer is truly a new experience and we are thrilled to share this innovation with beer lovers across the world. SCIENTIFIC - Engineered using patent-pending fluid & gas technology to enhance the flavor and taste of beer. ALL BEER STYLES - Fizzics™ enhances the flavor and taste of all beer styles, including IPAs, Pilsners, Brown Ales, Stouts, Porters, Lagers, etc. 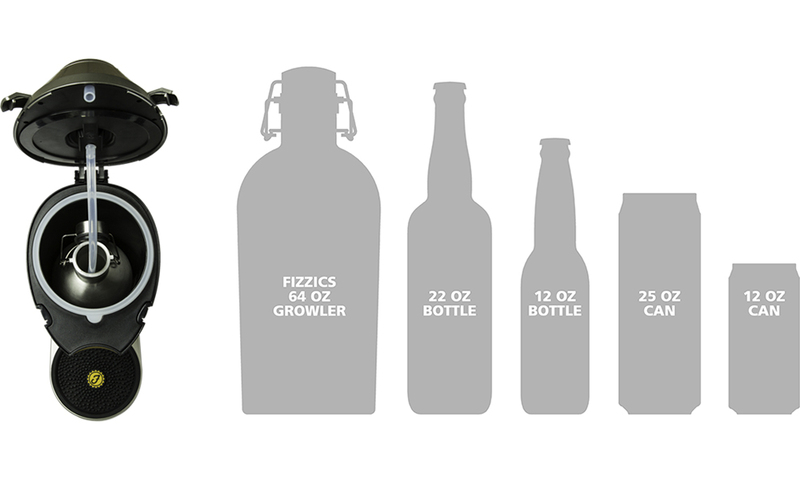 UNIVERSAL - Compatible with all size cans, bottles, and accommodates up to a 64oz growler. PORTABLE - Powered by 4 standard AA batteries. Lightweight and durable making it ideal for outdoor activities, camping, tailgating, etc. COMPLETE - Fizzics™ does not require CO2 or Nitro cartridges, proprietary replacement parts, or ongoing refills to operate. 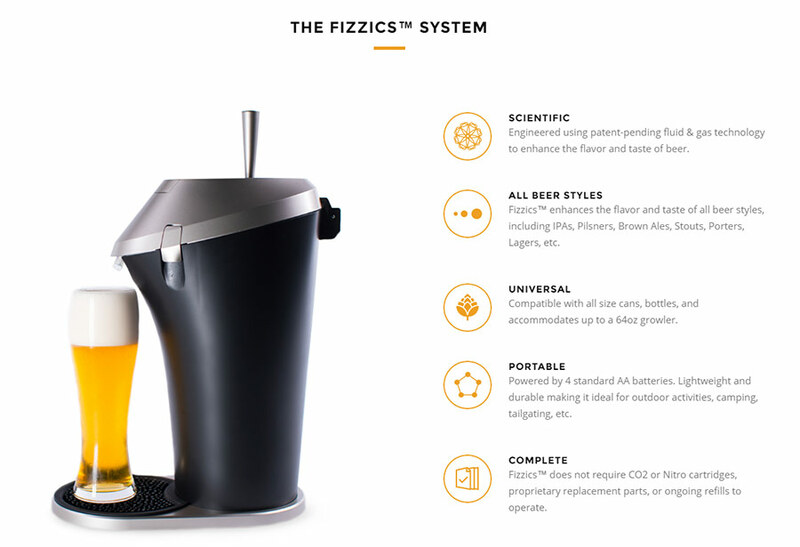 The Fizzics system utilizes a super sonic device which stimulates the bubbles in your chosen beer to the point where the particles are much smaller and it greater abundance. This lends to a cream-like frothy head that's not unlike that found in cream ales and stouts such Guinness and Kilkenny. This means that any carbonated beer added to the system will end up with a beautifully creamy head. In essence this means that Fizzic breaks up the larger bubbles into smaller, more densely packed bubbles, which would otherwise result in foam collapse and reduced flavour. * Requires 4X AA batteries sold separately. This is one of the appealing attributes about this system. It can dispense just about any carbonated beer in any bottle or can that's out there. It also accommodates 1.9 liter growlers which will be available from Mantality soon enough. Failing that, you can also pour your beer straight into the removable container which should hold around 2 liters of your favourite brew. This essentially makes it an all purpose party and event dispenser for beer as well as other beverages. G&T, cider and more on tap anyone?! What we thought could be especially neat is if you add 2x 750ml quarts of beer to the Fizzics system, and then add a Hop Theory sachet, you could essentially have close on 2 liters of the finest 'home-concocted craft beer' available to dispense at a party, braai or venue. Dispenses all sorts of carbonated beer. Craft beer - pale ales, IPAs, bitters, lagers, weiss, stouts, porters, bocks and more. We tested it with a Heineken, &Union Everyday IPA and a homebrew (an APA made with our DIY Microbrewery Kit). The IPA needed a bit of extra TLC when pouring as it was frothy to begin with but once you get the hang of the angle and the rate of pour, you're A for away. The Fizzics beer dispenser system is perfect for anyone that appreciates good beer. From homebrewers to craft beer connoisseurs, it allows for the guy at home to take an already good beer and make it exceptional. I love that it can accommodate just about all types of beer containers currently on the market without the need for any C02 or keg equipment. You just add batteries, open a beer and pour away. By pulling the tap lever forward, this dispenses the beer. Once you're about 3/4 of the way full you gently push the lever backward to engage the patented sound wave technology. You'll then see the creamiest foam dispense out, to leave a moutwatering head, full of aroma atop your fresh beer. Another great thing about the Fizzics system is that it's really easy to clean, and you don't need any fancy beer line cleaning solutions or chemicals. Simply place a cup of warm water and move the tap handle back and forward a few times to clear out any beer still in the system. If you're using the inner container, all you need to do is rinse it out with warm water as well.